Richard Brown has been the Secretary-General of the World Federation of Chiropractic (WFC) since 2015. The WFC, an NGO in official relations with WHO, has 93 national association members in 7 world regions and is principally concerned with the support, empowerment, promotion and advancement of the chiropractic profession internationally. Richard, 50, is a 1990 graduate of AECC University College and a 2009 graduate of Cardiff University Law School. He practised as a clinician for 25 years before relocating from his native United Kingdom to Toronto, Canada. He retains licensure in both the UK and Botswana. 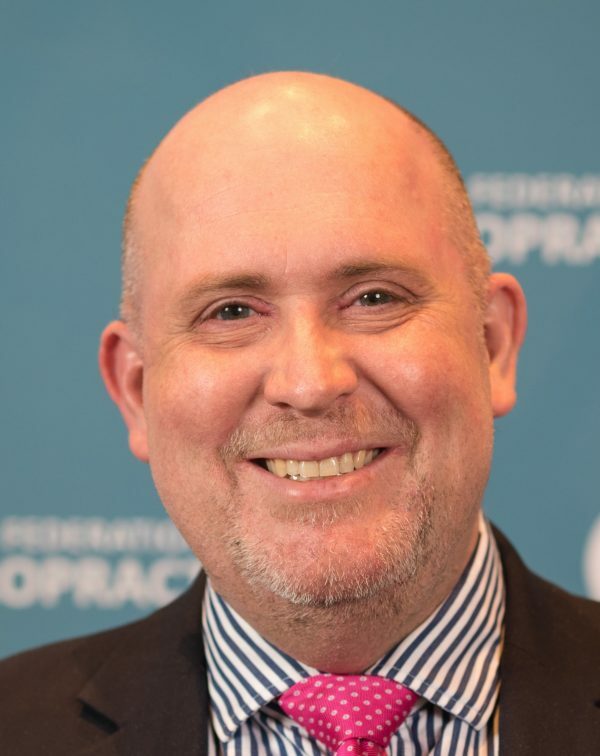 Richard is a past president of the British Chiropractic Association (2009-2013) and between 2009 and 2015 had a number of roles with the European Chiropractors’ Union, including its first Secretary-General. He has been awarded Fellowships from the Royal College of Chiropractors, European Academy of Chiropractic, British Chiropractic Association, and AECC University College. As owner and clinic director of a large interdisciplinary clinic in the UK, Richard has first-hand experience of working collaboratively with other health professions, including general medical practitioners, surgeons, physiotherapists, exercise professionals and podiatrists. In his clinical practice, Richard worked extensively in professional sport, including the English Premier League (football), elite athletics and Moto-GP motor sport. He remains a member of the Fédération Internationale de Chiropratique du Sport (FICS) and served as a member of the medical team at the London 2012 Olympic Games. In 2015, Richard spent time working with under-served communities as part of the World Spine Care project in Botswana. He is the founder and immediate past Chair of Trustees of the Chiropractic Research Council, a UK-based charity. He has educational experience as a senior lecturer at the University of Glamorgan (now the University of South Wales) and served on the Board of Governors at AECC. He served for a number of years as an examiner for the UK regulator’s Test of Competence. He has lectured extensively in the UK and internationally on professional standards and the status of the chiropractic profession. With a Master’s Degree in Law (LL.M) from Cardiff University, Richard has for many years worked as an expert witness in both the UK and Ireland and retains a medicolegal consultancy. Covering areas of clinical negligence, fitness to practice and statutory regulation, Richard has also been involved in drafting codes of ethics and standards of proficiency in Europe, Africa and Asia. He has consulted and audited on issues of chiropractic documentation and has designed case note templates. As Secretary-General, Richard is responsible for the leading the Secretariat at the WFC headquarters in Toronto and for strategic and policy development of the organization. Richard is married to Caroline and has two grown-up children. He enjoys walking, motorcycling, and following English professional football. In the distant past, he climbed Mount Kilimanjaro and was a member of a chiropractic band, Audible Release.